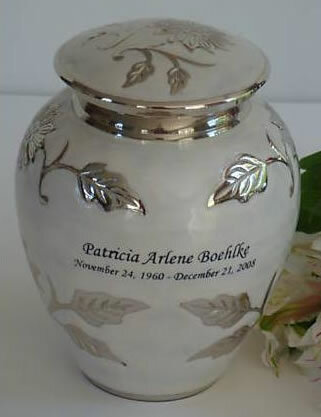 This charming Small Pearl White Florentine Brass Urn for Pets is solid brass urn with an pearlized enamel finish decorated with a nickel (silver color) embossed flower and leaf pattern on the urn and lid. A threaded "screw-on" lid allows easy loading and a felt base protects furnishings. This urn requires only an occasional dusting with a clean dry soft cloth. Please limite engraving to no more than 20 letters/numbers/spaces per line. Approximately 5 1/2" high by 4 1/2" wide and a volume of 45 cubic inches. Suitable for most pets with healthy body weights of less than 30 pounds. Is this urn the right size? We follow the guidelines set by the Cremation Association for North America (CANA). For pet urns, the industry standard for rough estimates is 1.5 cubic inch of cremains for every 1 pound of healthy body weight. This industry standard should only be used as an approximate size required. Many times, pets require a larger urn. If you have the ashes, you can measure them in the box. Start by measuring the length times the width. Then open the box and see how close the ashes come to the top. This is your height mesurement which you will multiply with the length and width. (Length x Width x Height = Cubic inches). Uns without engraving usually ships same day if ordered by 12pm EST. Please allow 4-5 business days for engraving.